This is a new WordPress Page where you'll find an upcoming VCP6.7-DCV Study Guide. In fact, the certification's name is “The VCP-DCV 2019 certification“. 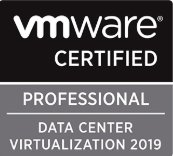 It is a new certification for 2019 focusing on installation, configuration, and management of VMware vSphere 6.7. Note: You must be VCP5, or VCP6. If, not, you must attend a class and have no “Delta” exam possibility. It means that you need “less effort” to achieve the same certification, the VCP-DCV 2019 certification, if you pass the VCP6.5-DCV exam (or the “VCP6.5-DCV Delta”). This page is Work-in-progress for now. 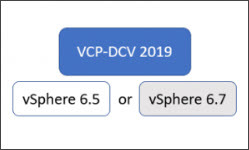 Quote: The VCP-DCV 2019 certification validates candidate skills to implement, manage, and troubleshoot a vSphere V6.7 infrastructure, using best practices to provide a powerful, flexible, and secure foundation for business agility that can accelerate the transformation to cloud computing. Here the current Blueprint: (Original PDF Online at VMware is here 2V0-21.19). Here are the direct links: (note that the location/content might change so I'm not proposing this set as ZIP). VCA | VCP | VCAP or VCIX exam vouchers. On-Deman Courses – Provides a robust, self-paced learning solution delivering modular training combined with hands-on practice labs, giving you a powerful alternative to traditional classroom training. VMware Learning Credits – Learning Credits provide the dual benefit of funding a well-trained IT staff, along with discounts options of up to 15 percent. Customers can schedule training when and how they need it. Customers can buy credits at the time of license purchase or as a stand-alone purchase.